Improved public transportation and mixed-use development along the waterfront are among the keys to economic development in Lynn, according to U.S. Rep Seth Moulton (D-Mass). 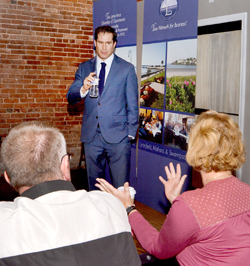 Moulton was the featured speaker during a roundtable discussion with the Lynn Area Chamber of Commerce’s Government Affairs Committee at Land of a Thousand Hills Coffee on Munroe Street Wednesday morning. The congressman told local business and political leaders that Lynn has been a priority in the district since day one. Moulton ticked off several of the points that make Lynn desirable for development and business, including waterfront property and its proximity to Boston. As he has mentioned in the past, Moulton noted that Lynn is the same distance from Boston as Brooklyn is to Manhattan. U.S. Rep. Seth Moulton answers questions and discusses his goals during a Wednesday morning meeting with Lynn business owners at Land of a Thousand Hills Coffee. Leslie Gould, the chamber’s president and CEO, got the ball rolling with a question about the deteriorating condition of the MBTA garage in Central Square. Moulton took the ball and ran with his desire to see public transportation improvements that would help economic and residential development in Lynn and on the North Shore. One of the biggest steps to increase opportunities for Lynn residents and businesses is the improvement of the public transportation infrastructure. Moulton said he’s a huge advocate of the north-south rail link that would connect North and South stations as well as the extension of the Blue Line to Lynn. With those steps, access to the airport and to Boston from the North Shore would be drastically improved, Moulton said. “The South Boston market is the fastest growing job market, but you can’t get there from Lynn,” said Moulton. He added that the new General Electric corporate headquarters in the Seaport district will bring in 800 employees, but that very few of them are likely to look for affordable housing in Lynn because of difficulties getting from that area of the city to the North Shore. Asked about the development of Lynn’s waterfront, Moulton said he’s in favor of mixed-use development combining residential and commercial properties. James Cowdell, executive director of the Lynn Economic Development & Industrial Corp., said Moulton is more than talk when it comes to supporting Lynn. “He’s the only congressman in my lifetime who has had a full-time person dedicated to Lynn and economic development,” said Cowdell. Moulton said he will continue to make Lynn a priority, and praised the city and business leaders who have helped start a real turnaround in the city. Adam Swift can be reached at aswift@itemlive.com.